The first ranking of the most chosen global FMCG brands launched today by Kantar Worldpanel reveals the brands that are being bought by the most consumers, the most often. It is Coca-Cola that leads Kantar Worldpanel’s Brand Footprint ranking as the world’s most chosen brand, being chosen 5.3 billion times a year. The beverages drink manufacturer reaches its number one spot by combining a high penetration of 44% with the highest global frequency of purchase (15 times per year on average) meaning that it is chosen a total of 5.3 billion times a year. The report highlights the opportunities for growth that exist, with only one brand in the world – Colgate – reaching more than half of the global population (65% penetration) with its oral care products. The strongest global brands in the ranking have demonstrated their ability to understand and respond to local needs and reach the most remote consumers in rural areas of emerging markets by building larger distribution networks. However all of the brands still have plenty of room to recruit more shoppers in new geographies, new targets, new segments or on new occasions. 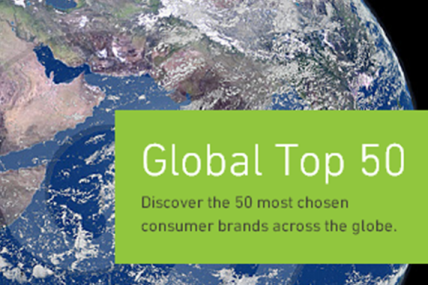 Find the top 10 global FMCG brands revealed by the Brand Footprint study clicking on the link to the right. Thirteen Billionaire Brands – Thirteen global brands are chosen by consumers more than one billion times a year – Coca Cola, Colgate, Nescafe, Pepsi, Lifebuoy, Maggi, Pantene, Knorr, Lay’s, Dove, Lux, Palmolive and Tide. Emerging markets drive 98% growth for the growing brands in the Top 50. Further, six of the top 10 brands in the ranking show significant increases in their growth driven by the emerging markets – Coca-Cola, Colgate, Dove, Maggi, Nescafe and Pepsi. Coca-Cola increased its growth in these territories by 7% gaining 230 million Consumer Reach Points. Dove top riser in ranking – no 10 in the global ranking, Dove grew its Consumer Reach Points by 18% to reach more than 1.1 billion. Other top risers are Tide, Vim, Oreo, Head & Shoulders and Bimbo. Global success doesn’t rely on being present in developed markets – The report reveals how a brand can achieve high penetration and sales without a high presence in developed markets. Japanese cooking seasoning brand Ajinomoto (no 19 in global ranking) for example reaches virtually no households in Europe and only 2.6% in the US. Tang, the most likely new entrant into the ‘billionaire club’ with its powdered drinks, is popular in emerging markets and the fourth biggest global beverage brand despite only reaching 13% of households. Globalisation is on the rise – Although international brand owners are driven by social- demographic and cultural trends, consumers often don’t differentiate between local and global brands. To achieve significant household penetration locally a global brand must know its consumers intimately and not impose the brand’s home culture on the local market. Colgate for instance achieves 86% penetration in India compared to 65% globally by having excellent urban and rural availability and by adapting to the local market with smaller pack sizes. Local brand giants – 23 local brands around the world achieve more than 500 million Consumer Reach Points: Roma, Tora Bika, Molto, So Klin, Energen, Sasa, Daia, Ekonomi and Sarimi in Indonesia; Lucky Me in the Philippines; Clinic Plus, Ghadi, Fair & Lovely and Tata Salt in India; Lala and Gamesa in Mexico; Wahaha, Shuanghui, Want Want and Bright in China; Almarai in Saudi Arabia and, finally, Oscar Meyer in the US and Warburtons in the UK. For more information about the Brand Footprint report, click here. Follow us on Twitter and use our hashtag #BrandFootprint to comment.